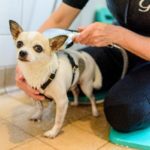 My name is Mr Darcy and I am a short-haired Chihuahua. I am highly intelligent and although I say it myself, very handsome! In 2013, when I was around 6-months old, I was experiencing excruciating pain and Brian Faulkner, my Vet, diagnosed me with Legge-Perthes disease in my right hip. Brian says that Legge-Perthes disease is a condition where the ball part of the hip joint becomes deformed due to a compromised blood supply. This makes the hip painful and causes a limp. In small breeds like me, the easiest solution is to remove the diseased hip by removing the ball of the femur. This operation is known as an excision arthroplasty or femoral head and neck osteotomy (FHO). The hip then forms a false joint which is functional and pain free. However, in order to do this the body needs to support the hip using well developed muscles around the rump. 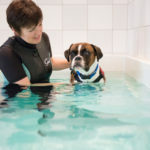 Brian is a very good friend of mine and he advised my humans that hydrotherapy would not only be useful but essential to my recovery and rehabilitation. 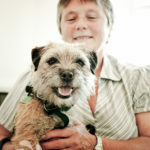 I was referred to Barbara Houlding at K9 Hydro Services. Barbara very quickly realised that I was very clever and understood my temperament. As a result she worked with me to get the desired result and she is now also one of my best friends. I started off with an assessment and had both land and water based physiotherapy treatment twice weekly and this quickly became weekly but as I improved this was reduced to fortnightly and I now visit Barbara every several weeks to keep me at my best as part of a maintenance programme. The land based treatment is wonderful as Barbara always gives me choices and I have been so relaxed and have been known to nod off on several occasions, not something I do anywhere else. I have never been very keen on water and always refuse to go out if it is raining but Barbara encouraged me by telling me how clever I was and very soon I was in her lovely warm pool and enjoying it. We have such a great trust and understanding, even though she is human! 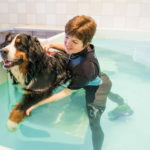 I now really look forward to my physiotherapy and hydrotherapy sessions and thanks to Barbara, I am now very happy and can walk, trot, run and do everything I want to, even though I am known to overdo it at times!